At beginning of the year 2018, planet Saturn is in Sagittarius sign (10th house) and Jupiter is placed in 8th house for Pisces sign. 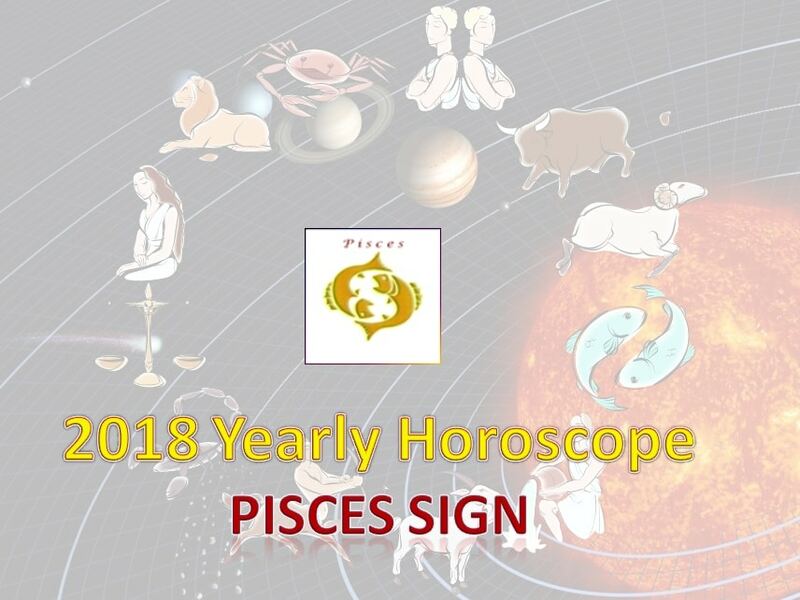 The New Year 2018 will be a year of growth and expenses for the people born under the Pisces Moon Sign. Especially the year 2018 will bring about changes in your life like marriage, building your house, childbirth and other such celebratory expenses. Those who were troubled about their impending marriage of their child will successfully complete their duties. People who were suffering from lack of stable jobs, financial crunches and poor salary will see a change for the better. In year 2018, you will earn well and spend money generously. You won’t be able to save your money. If you had any feelings of sadness about being overused and under-appreciated, your talents not exposed, those situations will change. Your confidence levels will rise. At the same time, you will travel abroad or faraway places frequently for your work. You will journey to northern states or countries. You will travel to a long dreamed destination. The young Pisceans will see positive changes like marriage, childbirth, permanent job. Most importantly, you will look and feel ten years younger and stronger. Unmarried people will get married. Some will marry the partner of your choice. Those who were hesitant to speak out about their love will do so and get your parents’ consent. You will have to shell out your savings and money for your children. Expenses in the form of education, marriage and other foundations for their life will come up now. Publishers and journalists will have to journey incessantly for their work. They will not be properly paid for your work. Artists will find it difficult to get their salaries for work done. For women, their work burden will increase. You will have to work harder at your home and at work. You will get an unsympathetic boss. But your home front will be calm. You will feel tired of life. But do not disclose whatever you feel to anyone as it might be misconstrued. At the same time, marital relationships will improve. Your husband will understand you and you will start functioning well together. Though you might face expenses on account of your children, they will be constructive ones. You will buy many items for your house. The coldness in your married life will vanish. Childless couples will be blessed with children. Some will benefit from foreign trading. Some will travel abroad. People of other religion will help you. Your father will support you. Your paternal property will be useful. Those in mathematics and computer science field will be appreciated. Those who can earn through shadow deals, especially in the field of construction and real estate will profit from this. For government employees, your unsympathetic and demeaning boss will get transferred. In his place, you will have a supportive boss. Government related employees will earn well. Especially people in uniform like police, judiciary, high level officers and judges will have a good year. People in charity work and politicians will have a great time. If you hadn’t visited the family deity earlier, you will get the opportunity to complete the rituals and visit the temple. You will go on pilgrimages. You will visit holy places of saints and sages. Foreign settled will have a profitable year ahead. Those awaiting green card in their respective countries will get them. You will visit your parents at their native places. The country where you reside will have few disputes. Problems in obtaining your share of the ancestral property and partnership problems will get resolved. In short, everyone will have a beneficial year, this 2018. You will welcome the positive changes in your life and along with the lessons learned, you will build a strong foundation for your future.